Want answers to your most burning questions about DeedGrabbing? Maybe they've been asked before! I've posted the most often asked questions here with answers. If the answer to your question is not found here, email us! What is the "catch" – don’t banks still hold title on houses that are mortgaged? There really is no "catch" - other than actually having to go out and do something! No push-button profits here or anywhere else in real estate. If someone owes loans on the property how can they just sign the house over to your name for $50, wouldn't you end up having to pay for his loans? When you get an owner who is walking away, say "Well, if you're letting the property go anyway, would it help if I took got it out of your hair and gave you $50 for your time signing the paperwork?" If they say yes, go get the deed from them. Don't record until you check title and find a buyer. If title's good, then find your buyer and close. This is much better than finding and assigning because you are in control of the deal at all times. When you try to assign agreements, the parties will often try to go around you and cut out your profit. This way you only have $50 invested and if you can't sell it's no big deal. There is a little upfront money and risk, but you can’t get odds like this at the casino! We are dealing with mostly run-down properties and land. However I have gotten some nice properties too. If you price a run-down property right, and you got it cheap, it will sell and you'll make money. Rehabbers buy run-down properties. Have you seen those shows on TV "Flip this House", etc? People come in, buy cheap from you, then fix up and resell for a profit. People with good credit buy these all the time to fix up and move in or resell. A lot of people pay cash for these too. How i can discover that an owner is involved in a bankruptcy ? Asking them is the easiest way. You can also sign up for a "Pacer" account which allows you to look up any bankruptcy or federal court case. It's really a cool and helpful piece of info. I'm glad that you shared this useful information with us. Please keep us up to date like this. Thanks for sharing. It is very good info. But would like to know if this works for CA. California has tax deed sales once per year (usually) in each county. You can get the tax sale lists and reach out to the owners. For owner addresses, you'll need to subscribe to a service, the counties don't give them out (by law). Parcelquest.com is a good one. When can we get an example about the seller acknowledgement you use in the contract? NY (Suffolk county) by the time the property is going to a Deed sale (Real Property Auction)? Or does the original owner still have ownership so that we can apply the deed grabbing process? Not sure about that - but we won't be using the deedgrabbing process with this technique. Best to ask the county directly on your question. Very good info I am interested contacting owners after the tax deed sale has taken place.I live in Florida which has a 2 year redemption period for tax deeds I would like to contact delinquent tax owners before the redemption period ends does your book provide information on how to do that? I bought another course that deals with redemptions exclusively but it is really vague, like I said earlier I want to contact delinquent tax owners AFTER the tax sale and buy their redemption rights or the property itself to redeem it would your book help in that? The first sale is a tax LIEN sale in Florida, and yes the book does provide info on how to that. After 2 years, the property goes to a tax DEED sale which is final. Right before the tax deed sale is a good time to approach owners, or you can "farm" a larger number of properties that have had liens sold earlier but aren't quite to the deed stage yet. Rick do you still deedgrab or are you just concentrating on diamonds in the rough? I have info on a property in my area that the HOA is pursuing foreclosure on for back dues. It's also getting behind on taxes and the owner is now in a home. The place has been ransacked and I'm sure the owner wouldn't have the deed in her possession. Not sure how to proceed. Have always used an atty to close a property purchase. Do I need one for this here in GA? I sure would appreciate your getting back to me. This is a very good deal for somebody. I'd sure like it to be me. Thank you. The owner doesn't need to have the deed "in her possession" like you might a car title, in order to sell it. The concern I have is that if the HOA is foreclosing, there is also a mortgage on the property. If you buy from the owner you will have that loan still against the property. I know there are some interesting situations where HOA becomes first lienholder and wipes out the mortgage but never really got into working that angle (if it can in fact be worked). The property needs to have equity as it sits, for you to get involved, if there's a mortgage (and I'm 90% there will be) there may be no equity. Finally I think i was perturbed to notice that GA and SC now require all real estate transactions signed within the state, for properties located in the state, must be presided over by an attorney who drafts the paperwork and does the closing. This is not a good direction we are moving in where everything is getting gummed up. Thanks You are a PRO and a GOOD ONE The inf is first class. 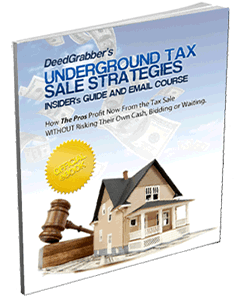 I enjoyed your ebook and it give us another tool to use with people that have had challenges that show up at the tax sales. Also if an investor should have a problem with this tool, I just ask him why didn't he offer to help the guy that just lost his property to a tax sale? He could have offered the guy a little extra money to have the deed and stop the redemptive rights. Sometimes it does not pay to be too greedy. I would never leave this step out when I buy a tax property at the court house steps now if I was more interested in the property than the interest yield. Again thank you for useful information!" 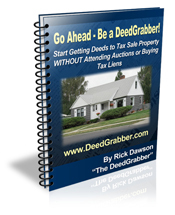 "For anyone interested in learning about buying tax defaulted properties, Rick Dawson's DeedGrabber course leaves no stone unturned. He covers everything an investor needs to know from A to Z without the usual fluff found in other study courses. If that were not enough, Rick is always available for questions by either a phone call or e-mail. Best yet, I don't have to wait days or weeks for an answer to my questions -- Rick responds within hours. I couldn't be more pleased with Rick and I highly recommend his DeedGrabber study course." I found DeedGrabber to be complete and easy to follow. You don't need to buy more to get started. Plus I found your conference calls and help to to make all the difference. I would recommend your DeedGrabber system and book to anyone. I just want to thank you for the excellent info that you provided in your book; you lay out step by step how to go about purchasing homes before the tax sale. I live in Houston, TX (Harris County), and have utilized a service that allows me to search all delinquent tax properties, and even filters by whether or not there is a pending tax lawsuit, judgment, or bankruptcy on the property. I have my eye on one property in particular in my neighborhood that I found through the information service that I subscribe to; it has a lot of potential. So far, I have put in a couple phone calls to the property owner, but have not heard back yet. I just need to go ahead and follow your process, so that I can start doing deals. Thank you for everything that you do. Keep up the great work!"